Comments: "I work for money, but I figure I owe the Empire a little something. When Chewie called, I decided it was time to pay the Empire back." 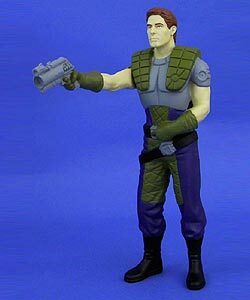 A mercenary and gambler, Dash Rendar is also one of the best pilots in the galaxy. When Princess Leia hires him to be Luke Skywalker's bodyguard, Dash is caught in the struggle against the forces of Prince Xizor, fighting in the SHADOWS OF THE EMPIRE.